I came across Stephannie Barba's Couture maps - they are amazing and beautiful. 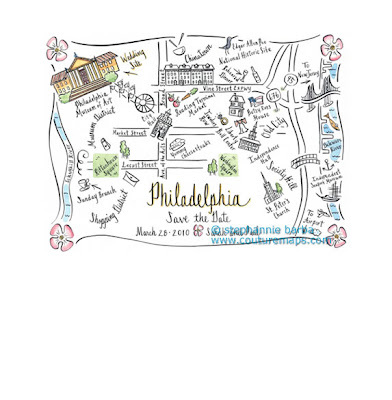 She has created very unique hand painted maps of certain cities in the US and abroad, Philly happens to be one of them. When used as a save the date or even enclosed in your invites it definitely sets the tone for event. She will customize to match your wedding theme and invitation. She does research on the city of your choice and includes where your wedding will be to make it unique to you. Pricing is $400 for design and about $140 for 100 cards to be printed. This is very custom though - you can pick any paper or size and even add color. If you use artwork she has already created the costs could be a little lower.